From January to April 2019, Abodoo is conducting some smart business workshops roadshows with our partners at Vodafone and Small Firms Association (SFA). These workshops are aimed at Irish businesses and offer a series of informational sessions about smart working, HR and profit growth. Given that these roadshows are happening nationwide, we thought it was time to share some top tips with companies looking to prepare their workforce for the immediate shift taking place, with flexibility and a smart working workforce becoming the new norm. Having a smart working workforce means creating easy access to data. Our first tip is to upload all your data to the cloud so that it is organized and accessible in one place. One of the best ways to do this is to use a cloud-based customer relationship management (CRM) software. The best part about a CRM software is that it can do pretty much everything in one place. You can create a marketing strategy, a communication strategy, conversion information, and customer data. Putting all your data in one place makes it easier for you to run your operations smoothly. You can analyze customer relationships and build a strong marketing strategy to enhance profits. Efficient access to information is essential when you have a remote workforce. Having a seamless and efficient communication system is important when setting up a smart working workforce. When your employees are not in front of each other, being able to communicate instantly is crucial. The importance of communication cannot be understated. If there are glitches in getting messages across, it can have serious consequences for your business. There are plenty of communication software and tools out there. Some prime examples are Skype and Slack. Of course, there is always email and Google hangouts, but software like the ones mentioned above helps you to create communication groups and threads to get a message across. You can create threads for various departments, set up virtual meetings and send out bulk communication. Although smart working is a ‘dream job’ for many, not everyone is cut out for it. There are some people who do well with a 9-to-5 schedule instead. 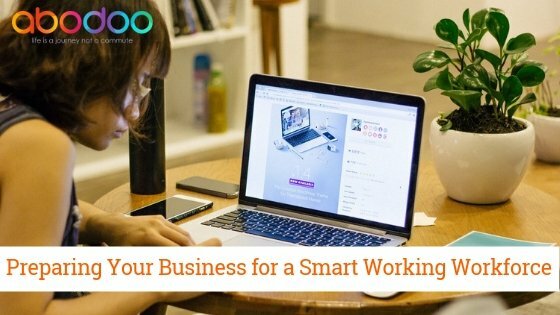 So you need to find the right kind of employees to join your smart working workforce. First, make a list of the skills and qualities you want your employees to have. Do you want them to be adept at using technology? Or have prior experience of a work-from-home scenario? The next step is to narrow down the behavioural traits that you want to see in your remote workforce. Once you have these traits written down, it will be easier for you to select candidates based on how they present themselves during the interview and the prior work experience that they have. A smart working workforce is the new norm for the future. Why, it has already begun to take shape. Companies across the world are increasingly offering flexible working as part of employment packages to their employees. Jump on the bandwagon and start preparing for this eventuality. There are plenty of tools out there to help you. Keep our top tips in mind and successfully build your smart working workforce.